Protected areas remain a cornerstone of global conservation efforts. The double impacts of climate change and biodiversity loss are major threats to achieving the Millennium Development Goals, especially those relating to environmental sustainability, poverty alleviation and food and water security. The growing awareness of the planet’s vulnerability to human driven changes also provides an opportunity to re-emphasize the multiple values of natural ecosystems and the services that they provide. Protected areas, when integrated into landuse plans as part of larger and connected conservation networks, offer practical, tangible solutions to the problems of both species loss and adaptation to climate change. Natural habitats make a significant contribution to mitigation by storing and sequestering carbon in vegetation and soils, and to adaptation by maintaining essential ecosystem services which help societies to respond to, and cope with, climate change and other environmental challenges. Many protected areas could be justified on socioeconomic grounds alone yet their multiple goods and services are largely unrecognized in national accounting. This paper argues that there is a convincing case for greater investment in expanded and better- connected protected area systems, under a range of governance and management regimes that are specifically designed to counter the threats of climate change, increased demand and altered patterns of resource use. The new agenda for protected areas requires greater inclusivity of a broader spectrum of actors and rights holders, with growing attention to landscapes and seascapes protected by indigenous peoples, local communities, private owners and other actors which complement conservation areas managed by state agencies. Greater attention also needs to be focused on ways to integrate and mainstream protected areas into sustainable development, including promotion of “green” infrastructure as a strategic part of responses to climate change. This article was reviewed by Adrian Phillips and Linda Krueger. 1Over the past 50 years human activities have changed ecosystems more rapidly and extensively than at any comparable period in our history with more than 60% of the world’s ecosystems already degraded (Millennium Ecosystem Assessment 2005). These changes have generated many economic gains but at growing environmental costs, including biodiversity loss and land degradation, which in turn has resulted in many economic, social and cultural losses. Communities that rely on sustainable use of natural resources find themselves particularly vulnerable to biodiversity and ecosystem degradation. However, the news is not all bad. Evidence is emerging that the long-term investments being made by national governments and communities in protected area systems globally are having a large pay-off. Protected areas are an efficient and effective means to address biodiversity loss, help buffer society from the effects of climate change, and maintain the critical ecosystem services on which all societies depend. 2Habitat loss, fragmentation, overexploitation of natural resources, pollution, and the spread of invasive alien species have long been recognized as the “Big Five” threats to global biodiversity. The Global Biodiversity Outlook 3 published in 2010 showed that most threats to biodiversity were increasing, largely driven by our failure to protect ecosystem integrity, the growing surge in human population, and unsustainable approaches to consumption and unlimited growth. The same report found that expansion of protected areas was one of the few positive indicators of environmental performance (CBD, 2010). In the last decade climate change has emerged as the key development and environmental concern of the new millennium. Climate change will exacerbate the other sources of environmental degradation and may generate new threats with devastating consequences for both biodiversity and human welfare, especially for the poorest and most vulnerable communities and nations. Protected area systems, if designed appropriately and managed effectively, can make a valuable contribution to overall efforts to address these challenges. 3A number of initiatives have highlighted the likely impacts of climate change on biodiversity (e.g., Bellard et al. 2012). Even a relatively modest 2 degree C global temperature rise will cause significant modifications to ecosystems and their functions, (Bergengren et al., 2011). Climate change is not only a threat in its own right, but many of the response measures being designed for mitigation will also impact adversely on natural habitats and biodiversity (World Bank 2010a). Already the demand for biofuels has led to more rapid deforestation and agricultural expansion for sugar cane, soya and oil palm plantations in the tropics. The clearance and burning of peat swamp forests for oil palm production in Indonesia, for instance, is estimated to have been a major contributor to greenhouse gas (GHG) emissions, making Indonesia the world’s third largest emitter of GHGs in 2006. Investment in more renewable energy sources, such as hydropower and geothermal energy, can lead to loss of natural habitats and disruption of ecosystem processes unless carefully planned and implemented. Adaptation to climate change is likely to involve more investment in dams, levees and reservoirs to buffer against increased variability in rainfall and runoff and flood control; such infrastructure may be essential for economic development, but can reduce important ecosystem services, and dependent livelihoods, through their impacts on the volume, pattern, and quality of flow (Hirji and Davis, 2009). 4Climate change over the past 30 years has produced numerous shifts in the distributions and abundances of species and has been implicated in at least one species-level extinction (Thomas et al, 2004). Estimates of future extinction risk vary considerably; one study identified an extinction range from 1% to 29%, depending on the biome, with an estimated 4% extinction of species in tropical forests (Thomas et al. 2004, Bellard et al. 2012). What is clear is that some habitats will be particularly affected, including freshwater systems and coral reefs. It is projected that the ocean will be particularly badly hit with much extinction predicted at mid- to higher- latitudes as shifting species encounter unfavorable conditions or ‘run out of ocean’ as they encounter continent margins, also opening up the opportunity for mass species invasions towards polar regions (Cheung et al. 2009). Overall, species will adapt, move or die out locally and ecological communities will reorganize around those species that are able to colonise new climatic zones. 5There is good evidence that protected areas, planned as part of larger and connected conservation networks, offer practical, tangible solutions to the problem of species loss and adaptation to climate change (e.g., Hannah et al. 2002). IUCN defines a protected area as “a clearly defined geographical space, recognised, dedicated and managed, through legal or other effective means, to achieve the long-term conservation of nature with associated ecosystem services and cultural values” (Dudley, 2008), with nature conservation the priority objective. This definition is expanded with a series of six management categories (I-VI), ranging from strict protection with limited human access to protected landscapes and seascapes, which are cultural landscapes, often with settled human communities, managed as protected areas. Sites may be nested: strictly protected core areas may be surrounded, buffered and connected by protected areas where some resource utilisation is allowed. Over time, protected areas have undergone important changes in ownership and management patterns; from an almost exclusive focus on government management of state-controlled lands to a far more pluralistic model (Borrini-Feyerabend et al. 2004). IUCN recognises four types of governance: (1) by national or local governments; (2) various forms of shared governance including transboundary protected areas across national borders; (3) by non-profit or for-profit private enterprises; and (4) by indigenous peoples and local communities (indigenous and community-conserved areas) (Dudley, 2008). A strong protected areas network may include most or all of these management categories and governance models, providing maximum flexibility and resilience to changing political and social conditions. 6Despite a major growth in protected areas in the last few decadesthere is still an urgent need for an expanded protected area network with improved connectivity to slow biodiversity loss and to maintain ecosystem integrity and function. A recent analysis of the overlap between protected areas, Important Bird Areas (which comprise more than 10,000 globally significant sites for conserving birds) and Alliance for Zero Extinction sites (600 sites holding the last remaining population of highly threatened vertebrates and plants) found that less than half of these sites were protected (Butchart et al. 2012). Protection should also ensure that ecosystem complexity is recovered, especially in the ocean, so that ecosystems are more resilient to climatic shocks. Conservation biology confirms the need to protect large areas and maintain connectivity along altitudinal gradients. Yet natural ecosystems are becoming increasingly fragmented and many protected areas have become isolated “islands” within more intensively used production lands. Maintaining connectivity between protected areas through a mosaic of conservation-friendly land uses, under different tenure and management regimes, will be a key strategy to allow plant and animal species to adapt to climate change, especially for wide-ranging and migratory species such as large herbivores and predators at the head of the food chain. 7Large-scale connectivity conservation initiatives are already underway on all continents, including national efforts such as the Yellowstone to Yukon initiative, transnational conservation areas in the Greater Virunga landscape in Central Africa and designation of biological corridors such as the MesoAmerican Biological Corridor (Worboys et al. 2010). New protected areas and mosaics of landuse are being designed to establish ecological corridors in Mexico and the Vilacamba-Amboro region of the Andes in Colombia, Venezuela, Ecuador and Peru (World Bank, 2010a ). In South Africa megareserves in the Greater Cederberg area and elsewhere in the Cape Floristic Region include government-designated protected areas, and community and private lands under stewardship arrangements and sustainable management to create biological corridors from the mountains to the sea (Sandwith et al. 2010). Similarly the Australian government is proposing a whole-of-continent approach to connectivity conservation, combining the goals of biodiversity conservation and climate change resilience through a National Wildlife Corridor Plan. 8Atthe 10th Conference of the Parties of the Convention on Biological Diversity (CBD) in Nagoya, Japan in 2010, countriescommitted to increasing the coverage of protected areas by 2020 to at least 17% of terrestrial and inland water habitats (up from 12.7% currently) and 10% of marine areas (up from 6.3% of coastal waters and just over 1% overall). Another 17 of the 20 so-called Aichi Targets agreed in Nagoya also have implications for the expansion and improved management of protected areas. Protected areas, from national parks to community-managed nature reserves, are the cornerstones of biodiversity conservation, but generating support for more such areas will require stronger social and economic arguments to engender the necessary political backing and acceptance by communities, governments and industry. An important step in this process is the growing consensus between the parties to the international conventions on climate change (United Nations Framework Convention on Climate Change UNFCCC) and biological diversity (CBD) on the need to strengthen management of natural ecosystems as part of climate change response strategies. 9Ecosystems and biodiversity are not just victims of climate change, but can also play a critical role in mitigation and adaptation. While the primary focus of climate change strategies is likely to remain on cleaner energy technologies and reduced emissions of GHGs, there is increasing recognition that natural habitats, and in particular protected areas, can make a significant contribution to mitigation by storing and sequestering carbon in vegetation and soils, and to adaptation by helping societies to respond, and adapt, to the changes that are occurring (Dudley et al. 2010 World Bank 2010a, MacKinnon et al. 2011). Yet the multiple goods and services which protected areas provide are largely unrecognised in national accounting even though the Aichi Targets and Rio+20 call for improved natural resource accounting. 10Terrestrial, freshwater and marine ecosystems play a significant role in the global carbon cycle, serving as major carbon stores and sinks, mitigating and reducing GHG emissions from energy production, transport and land use change. Forests cover some 30% of the world’s land area but store 50% of terrestrial carbon, including soil carbon – see Box 1. Inland wetlands, particularly peat, contain large carbon stores as do grasslands, which are estimated to hold 10–30% of global soil carbon (Parish et al. 2008). Coastal and marine habitats, especially salt marshes, mangroves, kelp and sea grass beds are also important carbon sinks. Although covering just 2% of the Earth’s surface, they are responsible for around 50% of the transfer of carbon to the sediment and sequester carbon more efficiently than terrestrial ecosystems of equivalent area; (Laffoley and Grimsditch 2009). With poor management or conversion, however, these habitats can easily switch to become net sources of carbon, and habitat loss and degradation are already responsible for approximately 20% of annual carbon emissions (Gitay et al. 2002, Baumert et al. 2006). For habitats such as mangroves and peatlands where carbon laid down over thousands of years is released by anthropogenic activities, the release is rapid and then sustained for many decades, and is often significant at national or indeed regional scales. Research from the Australian National University showed that Australian natural forests have far larger carbon stocks than had been previously recognized. Mature, undisturbed stands hold the greatest stocks, a fact which provides compelling evidence for increased protection and appropriate management. The estimated amount of 950 million tonnes carbon currently stored in the vegetation and soil of the Great Western Woodlands, 16 million hectares of forests and shrublands, is equivalent to more than six times Australia’s greenhouse gas emissions for 2008. Most of this ‘green carbon’ is stored in the soil, with every hectare containing an average of 40 tonnes of carbon. An additional 20 tonnes of carbon per hectare, on average, is stored in the trees, roots, woody debris, branches, and shrubs across the region. Sites located in the mature eucalypt woodlands have higher carbon stocks than those which contain fewer or smaller trees (e.g., shrublands and mallee ecosystems). The highest amount of carbon is found in mature eucalypt woodlands that have not been disturbed by logging, pastoralism or mining. Wild fires are the biggest threat to carbon stored in the Great Western Woodlands, with more than 2.5 million hectares burnt since 2000. With strengthened protection and improved fire management almost 1,550 million tonnes of carbon could be stored in the Woodlands, 600 million tonnes of carbon more than currently stored there. Source: Berry et al. 2009. 11The global protected area network is by far the most extensive natural resource management system that aims to maintain natural habitats, encompassing national parks, wilderness areas, nature reserves and marine protected areas. While their primary objective is biodiversity conservation, protected areas also make significant contributions to maintaining other ecosystem services. For example, protected areas are conservatively estimated to store over 312 Gt carbon or 15% of the terrestrial carbon stock (Kapos et al. 2008) although the degree to which carbon stocks are protected varies among regions and under different management and governance regimes (Campbell et al. 2008). Protected areas and indigenous reserves in the Brazilian Amazon, for example, are likely to prevent an estimated 670,000 km² of deforestation by 2050, representing 8 billion tonnes of avoided carbon emissions (World Bank 2010a), contingent on effective management under a mosaic of landuse governance ranging from national and state protected area agencies to indigenous peoples and local communities in their territories. The role of natural ecosystems in carbon storageand sequestrationprovides strong arguments for increasing protected area coverage, and for expanding protected area governance to communities and the private sector, especially in carbon-rich habitats. It also argues for restoring degraded habitats, such as peatlands, to retain more carbon as is currently happening in Sebangau National Park, in Central Kalimantan, Indonesia, where drainage canals are being blocked to restore water tables and regenerate peatlands and protect swamp forests which are also important habitat for orang utans (DeVries 2010). 12Adaptation to climate change has, and will, become an increasingly important part of the development agenda, especially in developing countries most at risk from climate change (World Bank 2010a). Protected areas can complement other adaptation responses by maintaining ecosystem integrity, buffering local climate, and reducing risks and impacts from extreme climatic events such as storms, droughts and sea-level rise. For example wetlands, mangroves, coral reefs, barrier beaches and sand dunes protect coasts against storms and flooding (Dudley et al. 2010, Stolton et al. 2008). Such ecosystem-based approaches can complement, or even substitute for, more costly infrastructure investments to protect human settlements (Quintero 2007). Climate change is likely to lead to unpredictable and sometimes severe food and water shortages as well as the spread of certain disease vectors. Improved habitat management and protected areas can help to reduce the vulnerability of communities by maintaining essential natural resources and agricultural productivity and protecting ecosystem services, such as water supplies. 13Protected areas contribute to adaptation strategies by: protecting and enhancing vital ecosystem services such as water flows and water quality; conserving habitats that maintain nursery, feeding and breeding areas for fisheries, wildlife and other species on which human societies depend; reducing land degradation and protecting water sources by preventing, and controlling, invasive alien species; reducing pollution and maintaining coastal protection and natural mechanisms of flood control; and protecting reservoirs of wild crop relatives to enhance agricultural productivity and crop resilience (World Bank 2010a). The value of ecosystem-based approaches to adaptation was recognized by the UNFCCC at the 16th Conference of the Parties in Cancun in 2010 but discussions still continue as to how to best put this into practice. Such approaches will become more important as the impacts of climate change, changing rainfall patterns and erratic weather events become more severe. Although their role is often unrecognised, protected areas are already helping communities to adapt to climate change and cope with some of the greatest environmental challenges: food security, water stress and vulnerability to natural hazards as described below. 14Climate change and biodiversity loss are major threats to achieving theMillennium Development Goals, especially those relating to poverty alleviation and food and water security. Higher temperatures and more erratic rainfall patterns will result in severe decreases in water availability in many regions, increased risk of crop failure, overstocking and degradation of grazing lands, and ultimately livestock deaths and famine. In Africa, for example, severe water stress is expected to affect an estimated 250-700 million people by 2050 and crop production from rain-fed agriculture could decrease by 50 percent in some countries (World Bank 2010a). 15Growing concern over water scarcity provides a powerful argument for protection and improved management of natural habitats to maintain water supplies for both agriculture and domestic use (Dudley et al. 2010, Stolton and Dudley 2010, World Bank 2010a). Municipal water accounts for less than a tenth of human water use, but clean drinking water is a critical human need. Today, half of the world’s population lives in towns and cities, and one-third of this urban population lacks clean drinking water. Dirty water is one of the world’s largest killers, particularly of children. A key UN Millennium Development Goal is to: Reduce by half, by 2015, the proportion of people without sustainable access to safe drinking water. With expanding urban needs, cities face immediate problems related to access to clean water and mounting problems related to supply. Functioning natural ecosystems can help to maintain water quality and, in some circumstances, can also help increase the quantity of water available, through filtration, groundwater renewal and maintenance of natural flows. One-third (33 out of 105) of the world’s largest cities including Mumbai, New York, Sofia, Bogotá, Dar es Salaam, Melbourne, Quito, Tokyo and Sydney receive a significant proportion of their drinking water supplies directly from forest protected areas (Dudley and Stolton 2003). In South Africa the recognised value of the Cape mountain ranges and the Drakensberg in providing water supplies for Cape Town, Johannesburg and Durban has led to considerable national investments in the Working for Water programme to remove invasive alien tree species with high water needs (Pierce at al. 2002). 16Agriculture is the largest user of fresh water globally, taking as much as 50% of freshwater in many countries and up to 95% in some developing countries. By 2030, irrigated crop production is expected to grow by 80% in order to meet global food demand (World Bank 2010a). Many protected areas safeguard downstream water supplies for agricultural production. Economic studies in Madagascar showed that benefits from forest protection were much greater than conversion to agriculture with at least 50% of benefits accruing to downstream peasant farmers who relied on the watershed forests to provide adequate water supplies for irrigated rice production (World Bank 2003). One result of this is that Madagascar is now expanding its protected area network to six million hectares with substantial support from international donors and involving communities and other stakeholders in a comprehensive programme of protected area expansion. In Venezuela, about 20% of irrigated lands depend on protected areas while in Sulawesi, Indonesia, the 300,000 hectare Bogani Nani Wartabone (formerly Dumoga Bone) National Park was created to protect a major irrigation project designed to increase rice production (MacKinnon et al. 1986) – see also Box 2. In the Dominican Republic the Madre de las Aguas Conservation Area protects the source of 17 rivers that provide water for domestic use and irrigation to over half of the country’s population. Ankarafantsika National Park in Madagascar protects water supplies to the rice-producing region of Marovoay plains and the Lac Alaotra watershed, a Ramsar site, serves about 80,000 ha of rice farms. In Ecuador about 80% of Quito’s more than 1.5 million residents receive drinking water from two protected areas in the Andes, the Cayambe - Coca (400,00 ha) and Antisana Ecological Reserves (120,000 ha). Kerinci Seblat National Park in Indonesia protects the head waters of two of Sumatra’s major rivers, the Musi and the Batanghari, which provide downstream water supplies for major cities such as Jambi, Padang and Palembang as well as millions of hectares of irrigated farmlands. Eleven protected areas in the Australian Alps conserve 1.6m ha of catchments which deliver some 9,600 Gigalitres of high quality water annually to Australia’s food bowl, the Murray-Darling Basin. This water benefits more than 2 million people, with an estimated worth of $AUD10 billion per annum. The natural flow regimes and high quality water yield are directly linked to catchment condition maintained by well-managed protected areas. The 22,000 hectare Te Papanui Conservation Park, in New Zealand’s Lammermoor Range provides the Otago region with essential water flows valued at, NZ$ 93 million for urban water supply, NZ$12 million for irrigating 60,000 hectares of Taieri farmland and NZ$ 31 million for hydroelectricity. The 89,000-hectare Lagoas de Cufada natural park in south Guinea-Bissau was created to protect the largest freshwater reserve of the country. In a region where rainfalls have been reducing, this RAMSAR site plays a crucial role for water supply and for the survival of human communities and hundreds of plant and animal species. The protected watershed of Banff National Park in Canada flows into Alberta’s Bow River Basin which is home to 1.2 million people. The park supplies drinking water, provides recreational opportunities and supports farmers and industries well beyond its boundaries. 17Many protected areas act as natural reservoirs for agriculturally important biodiversity including wild crop relatives, pollinators and pest control. Protected areas in drylands include the sites of origin for important food crops such as barley, sorghum and other cereals, though crop wild relatives are still poorly represented in the global protected area network . Nevertheless protected areas such as Karacadağ Mountain in Turkey protect wild populations of crop relatives that may be important for crop breeding (Stolton and Dudley, 2010) while the protected areas of the West Tien Shan in Central Asia harbour walnut forests as well as the wild relatives of fruit trees such as apples, pistachios, and pears (World Bank 2003, MacKinnon et al. 2005). Similarly the Sierra de Manantlan protected area in Mexico protects populations of wild maize Zea diploperennis which increases disease resistance when crossed with crop cultivars (Stolton and Dudley, 2010). Elsewhere dryland protected areas are helping to introduce more sustainable land management practices that reduce land degradation and safeguard some of the greatest wildlife spectacles on Earth – Box 3. Rising populations of both people and livestock, combined with sedentarisation and reduced access to land, have led to overstocking and overgrazing in many rangeland areas. Around the world protected areas are working with local communities to implement more sustainable grazing regimes. Community agreements to reduce grazing in Jordan: Dana Nature Reserve in central Jordan lies in an area where traditional livestock grazing had radically altered vegetation patterns and increased soil erosion. Agreement with farmers to halve the numbers of goats has led to spectacular increases in vegetation cover and associated wildlife. Alternative livelihood opportunities for communities include ecotourism, jewellery making and sales of local herbal and fruit products. Improving pasture and carbon storage in arid areas of China: Grasslands constitute about 34% of the global stock of terrestrial carbon. During the spring and summer pastoralists move their livestock up to mountain grasslands in the protected areas of the Tien Shan, Altai Shan, and Qilian Shan. Shortening the seasonal grazing regimes is expected to reduce grazing pressure, improve plant species diversity and productivity, increase the amount of carbon entering the soil as plant residues and reduce soil loss due to overgrazing. Fencing against overgrazing and desertification in Kuwait: Habitat protection, including in some cases fencing against grazing by goats and camels, and active vegetation restoration is leading to biodiversity benefits and dune stabilisation. Controlling invasive species: In Masai Mara National Reserve in Kenya, local communities are working with the Kenya Wildlife Service to remove the invasive alien species Parthenium whichis replacing fodder grasses and reducing grazing available to wildlife and livestock. Restoring natural grazing patterns: Research in the Chimborazo Faunal Production Reserve, Ecuador has shown the ecological benefits of encouraging the husbandry of native camelids, instead of cattle and horses. Benefits include a higher stocking rate with llamas and improved pasture condition. Community conservancies in Namibia are managing marginal landsfor conservation, expanding the conservation estate for large-ranging mammals such as elephants and ungulates and providing livelihood benefits to communities from wildlife tourism. 18Just as on land, many marine protected areas have been created to achieve long-term biodiversity conservation but many are also contributing to sustainable fisheries and local livelihoods. Some 250 million people globally are dependent on small-scale fisheries for their protein (FAO 2009). A growing body of empirical evidence suggests that marine reserves can rejuvenate depleted fish stocks in a matter of years when they are managed collaboratively with the resource users. Fishing communities, both freshwater and coastal, are increasingly setting aside areas of water to provide safe nursery grounds for fish to maintain stocks. A review of 112 studies in 80 marine protected areas (MPAs) found strikingly higher fish populations and larger fish inside the reserves compared with surrounding areas, or the same area before the reserve was established; fish from within the MPA help to replenish adjacent fished areas (Halpern 2003). In coastal West African countries, where fisheries play an important role both as the main source of animal proteins and as a source of income for the governments, the role of well-managed MPAs for the renewal of fisheries resources has been increasingly recognized and endorsed. Fisheries monitoring in the Bamboung MPA in Senegal, for instance, has demonstrated an increase in fish size, species biodiversity and biomass less than five years after its establishment (De Morais et al. 2007). As a result seven countries (Mauritania, Senegal, Cape Verde, The Gambia, Guinea Bissau, Guinea and Sierra Leone) have collaborated to establish in 2007 a regional network of MPAs (RAMPAO), which now covers 25 protected areas. 19Elsewhere MPAs are also being recognised for their contribution to sustainable fisheries. In Indonesia many of the archipelago’s coral reefs and the small-scale fisheries they support have reached a level and mode of exploitation where the only way to increase future production and local incomes is to protect critical habitats and reduce fishing effort. With government support, 1500 villages within 12 coastal districts off Sulawesi, Aru and Indonesian Papua, are establishing collaboratively-managed marine reserves, many within existing marine parks, contributing towards a government target of protecting 30% of the total area of coral reefs in each participating district (World Bank 2010a). Such community-managed reserves are now being extended throughout the Coral Triangle, covering Indonesia, the Philippines, Papua New Guinea and the Solomon islands, helping to protect the world’s richest coral reefs and exceptional marine biodiversity. Locally-managed marine areas in the Pacific, based on traditional or locally-based reef and marine conservation customs, also play an important role in marrying sustainable use objectives with marine conservation targets (Mills et al. 2011). 20Protected areas maintain ecosystem integrity, buffer local climate, and reduce risks and impacts from storms, droughts and sea-level rise - all predicted to become more severe and frequent due to climate change. The multiple roles of protected areas will become more valuable as these climatic events become more severe, helping to reduce the impact of natural hazards and disasters and buffering vulnerable communities against all but the most severe flood and tidal events, landslides, and storms (Stolton et al, 2008). Intact mangroves provide protection and reduce the damage caused by tsunamis and hurricanes, while also harbouring vital fish nurseries. In Sri Lanka the Muthurajawella marsh near Colombo affords flood protection valued at over US$5 million/year (Costanza et al. 2008). In some cases, investments in protecting and natural restoring habitats (“green infrastructure”) may be more cost effective for reducing disaster risk than investing in hard infrastructure alone. In Vietnam where local communities have been planting and protecting mangrove forests as a buffer against storms, an initial investment of $1.1 million has saved an estimated $7.3 million a year in sea dyke maintenance and significantly reduced the loss of life and property from Typhoon Wukong in 2000 in comparison with other areas (IFRC 2002). 21Unfortunately, while the “protective” role those natural ecosystems can play is finally receiving attention, many ecosystems are continuing to decline. Environmental degradation increases the risk that extreme weather events and geological events such as earthquakes will lead to disaster for vulnerable communities. While the protection of ecosystems alone cannot halt the occurrence of natural hazards or extreme events, there is increasing evidence that large, healthy and functioning ecosystems are likely to be more resistant to the impacts of such events and reduce the likelihood of ecological and humanitarian disasters (Dudley et al. in press). Providing an opportunity for active or natural restoration of such systems where they are degraded or lost, such as reforesting steep slopes or restoring flood plains (Dobson et al. 1997). 23There is now a growing body of evidence about the economic benefits of maintaining natural ecosystems (TEEB 2009, World Bank 2010b). Wetlands are some of the most threatened ecosystems on Earth and generally under-represented in national protected area networks, yet they provide many vital ecosystem functions. Montane wetlands and freshwater rivers and lakes serve as vital water recharge areas and important sources of water for irrigation and domestic and industrial use. Freshwater and coastal wetlands downstream are also productive fisheries on which many of the world’s poorest communities depend. A recent analysis of the role of wetlands in reducing flooding associated with hurricanes in the United States calculated an average value of US$8,240 per ha per year, with coastal wetlands in the US estimated to provide US$23.2 billion a year in storm protection services (Costanza et al. 2008). A global assessment of the value of wetlands estimated that the median economic value of wetlands (at year 2000 values) for flood control is US$464 per ha per year (Schuyt and Brander 2004). Wetlands can also act as filters, removing pollutants and improving water quality. Bulgaria, Romania, Moldova and Ukraine are collaborating to establish a Lower Danube Green Corridor to protect and restore natural habitats, including establishment of Natura 2000 protected areas, with recorded benefits to fisheries, water quality and flood control (WWF 2008). Before the restoration efforts, the 2005 Danube flood cost Euros 396 million in damages, another illustration of the cost effectiveness of ecosystem-based approaches. 24The critical role of protected areas in reducing vulnerability and contributing to disaster mitigation is already well documented (Stolton et al. 2008, Stolton and Dudley 2010). What is now needed is greater awareness and appreciation of the multiple benefits that protected areas provide and appropriate measures to include ecosystem-based solutions into policies and practice. This will also require innovative financing mechanisms and institutional arrangements to promote more sustainable land management and green infrastructure as part of national and local strategies to ensure the safety of citizens against disasters. Such developments can also meet long-term recovery and livelihood needs, through provision of emergency foodstuffs and medicinal plants – see Box 4. Enhanced protection of natural habitats, especially through designation of protected areas, can provide a cost-effective third pillar to disaster strategies that also include better planning and early warning systems as well as hard infrastructure (Dudley et al. in press). The establishment of the Sanctuary of Flora Medicinal Plants Orito Ingi Ande, in the Colombian Amazon Piedmont, was proposed by the indigenous Kofán communities in part of their ancestral territory. The area covers 10,200ha of tropical and Andean forest, ranging from 700 to 3300m above sea-level and harbours rich biodiversity including an estimated 400 bird species and over a hundred medicinal plants , used by local people. The yoco liana, for example, is one of the most highly regarded medicinal plants in northwestern Amazon. At a time when colonisation and deforestation has seriously impacted many indigenous communities, the declaration of a floristic sanctuary, focusing on medicinal plants, is an initiative from an alliance of traditional healers. It combines ecosystem protection with that of the traditional medicine systems, thus contributing to the recovery of the area’s natural, cultural and intangible heritage. The category of Sanctuary of Flora of Medicinal Plants harmonizes the western perspective of biodiversity conservation with traditional integrated management associated with the Cosmovision of the Kofán People. The preservation and survival of their customs and traditions in the use and management of medicinal plants depends on the conservation of these territories, and teaching young members of the community about traditional medicines is a key aim of the sanctuary. 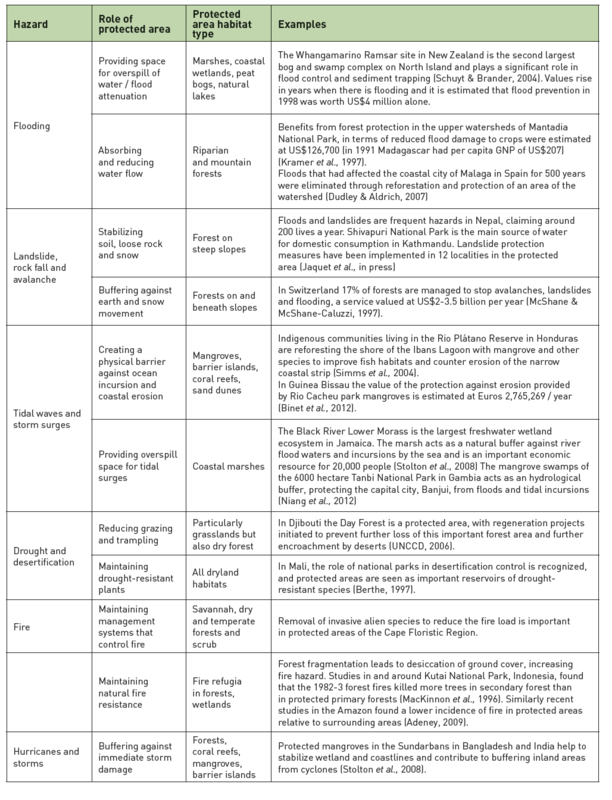 25Direct comparisons between the costs of investing in built infrastructure and maintaining natural habitats as protected areas are scarce, but some countries are already investing in habitat protection or restoration as part of disaster risk reduction strategies. A study of the value of investing in the restoration of forested wetland reserves in the USA Mississippi valley projected a return of $1035 per hectare (Jenkins et al. 2010). In Argentina and Ecuador, for instance, flood control projects, funded through World Bank loans, use the natural storage and recharge properties of critical forests and wetlands by integrating them into “living with floods” strategies that incorporate forest protected areas and riparian corridors (Quintero, 2007). A relatively small investment of $3.6 m in wetland protection and management, as part of a total outlay of $488m in flood defences in the Parana River basin, has now led to significant changes in state and municipal regulations in four provinces, including establishment of protected areas as part of flood protection schemes (Quintero, 2007). This incorporation of natural habitats into flood defences provided a low-cost alternative and supplement to more costly hard infrastructure, with the added benefit of high biodiversity gains through protection of 60% of Argentina’s birds and more than 50% of its amphibians, reptiles, and mammal species. This Argentinean example provides some useful lessons on how best to harness natural habitats as green infrastructure to reduce the vulnerability of downstream communities. 26Investments in protected areas globally (from both national and international funds) are difficult to calculate but have been conservatively estimated at US$6 billion annually with $750 million spent each year in tropical countries (Balmford and Whitten, 2003). This works out to an average $453 per km2 globally, though just $93 per km2 is spent in tropical countries. It has been estimated that establishing and managing a comprehensive global network of protected areas would cost roughly US$23 billion per year, more than four times the current expenditure but low to middle income countries would require less than one-tenth of this sum, just double what is currently spent (Butchart et al. 2012). Although these sums may seem large, they are tiny by comparison to the value of ecosystem services which natural ecosystems provide; indeed many protected areas can probably be justified on socio-economic values alone – see Box 5. Many studies have demonstrated the social and economic benefits of marine protected areas for fisheries and livelihoods (e.g. TEEB, 2009). With an EEZ of 230,000 km2 and a shelf of 39,000 km2, the Mauritanian marine area is considered one of richest in fishery resources in the world. Fisheries contribute about 6% of GDP, 25- 30% of the state budget and 35-40% of export earnings. With a total area of 1.2 million hectares, half of which is marine, the Banc d'Arguin National Park plays a crucial role in maintaining these resources. The park is an important breeding and nursery ground for a substantial portion of Mauritania’s fisheries (Landreau, 2007). In recognition of this role, since 2006 the Mauritanian government has been investing part of revenues from fisheries agreements with the European Union (about 1 milllion €/year) in the management of this park (EU 2006). Similarly the Rio Cacheu mangroves natural park in Guinea-Bissau covers an area of 88,615 hectares, with 68% covered with mangrove forests. The Rio Cacheu is important both for biodiversity conservation and as a nursery ground for several species with high economic value including shrimps. A preliminary study assesses the economic and social value of coastal and marine ecosystems within Rio Cacheu park to Euros 8.969 million/year (Binet et al. 2012) with most value from the mangrove ecosystems, including both direct uses (artisanal fisheries) and indirect services (coastal protection, water treatment, carbon sequestration, etc.). 27Initiatives such as the study on The Economics of Ecosystems and Biodiversity (TEEB) have given fresh impetus to the potential of payments for ecosystem services (PES), especially for water and carbon. Some government agencies and private sector companies already recognize the key role of protected areas in maintaining water supplies and other services. The Guanacaste National Park in Costa Rica, for instance, already benefits from payments from neighbouring citrus plantations for ecosystem services such as pollination, pest control and nutrient and water services (Janzen 1999). Since 1997 Costa Rica, a global leader in PES initiatives has invested over US$100 million in such schemes, with more than 80% of payments supporting conservation in national parks, biological corridors and strategic water catchments. PES schemes to compensate protected areas, communities, indigenous peoples and private landowners for maintaining forests and other water regulating habitats are also being piloted for water services in Colombia, Ecuador, Mexico, and Nicaragua. Nevertheless although the global value of ecosystem services in terms of water regulation and supply alone is estimated at US$2.3 trillion (Costanza et al. 1997) very little of this potential value is spent on ensuring this ecosystem function through better management of protected areas. 28A whole suite of new carbon funds has been developed to meet climate change targets for reducing forest loss and degradation (REDD), a major source of GHG emissions (World Bank 2010a). International finance for REDD+ (which incorporates restoration and conservation) could afford an exciting opportunity to protect forests for multiple benefits including biodiversity conservation, helping to expand protected areas and to benefit local communities engaged in forest stewardship. There is already much optimism but also debate about how REDD+ may benefit biodiversity conservation (Peskett et al. 2008). Unfortunately high-priority sites for tackling deforestation to reduce emissions may not always reflect other forest values such as biodiversity conservation, livelihood benefits, or water delivery (Miles and Kapos 2008). Moreover while carbon markets may have potential to promote conservation in less productive lands, prospects are less promising where competing land uses are highly profitable e.g. 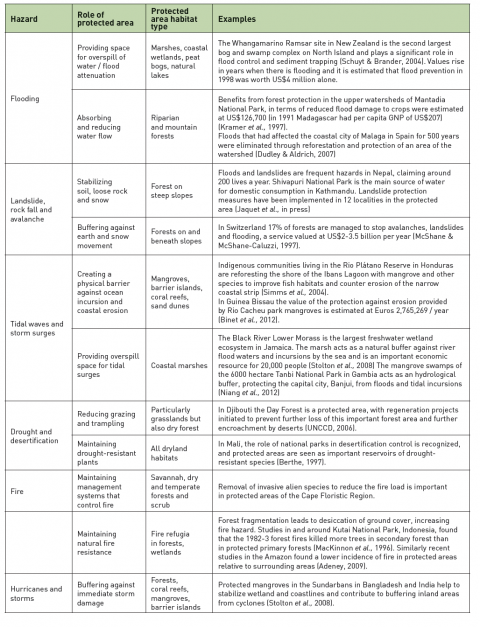 clearance of forests to establish oil palm plantations (Damania et al. 2008; Wunder, 2012). 29Questions also remain over governance issues; whether funds can be allocated for management of existing protected areas and how to reconcile REDD implementation plans with existing spatial plans and awarded concessions. Assuring the equitable distribution of revenues gained from carbon credits to communities affected by improved forest protection may prove to be a key challenge of REDD implementation (Peskett et al. 2008, Wunder 2009, Sandbrook et al. 2010). Nevertheless some successful pilot schemes are creating conservation corridors and providing financial benefits to communities for protecting high-biodiversity forest, with funding from voluntary carbon markets. In Madagascar, for instance, carbon revenue is being provided to local communities to protect the 425,000 hectares of the Ankeniheny-Mantadia- Zahamena Corridor, including restoration of degraded forests between the Analamazoatra Special Reserve and Mantadia National Park, in forests renowned for 17 endemic lemur populations as well as other rare and threatened species. 30While carbon funds and other payments for ecosystem services may provide extra incentives for protecting forests, and perhaps other natural ecosystems under expanded REDD+ initiatives, they will not be a “silver bullet” for biodiversity conservation nor for alleviating poverty. Experiences with Integrated Conservation and Development Projects (ICDPs) provide useful and cautionary lessons in managing expectations about the benefits of carbon funds and REDD resources (Wells et al. 1999, MacKinnon, 2001, McShane and Wells 2004). Nevertheless there is growing understanding of the need to strengthen conservation and management of natural ecosystems as part of climate change response strategies at both national and local levels. 31The increasing recognition that natural ecosystems have important values for human societies has not been accompanied by the same recognition of protected areas as institutional mechanisms for maintaining natural ecosystems, although the situation is gradually changing. Many research studies show that in most parts of the world, protected areas are amongst the most successful, and in some cases, the only successful way, of maintaining natural ecosystems, both from habitat conversion and degradation. 32An early study on threats facing 92 protected areas in 22 tropical countries concluded that most protected areas are successful in protecting ecosystems (Bruner et al. 2001). This was backed up by a survey of 330 protected areas around the world using a consistent methodology, which found biodiversity condition consistently scoring high (Dudley et al. 2007). A global meta-study assessed management effectiveness evaluations from over 2300 protected areas and found that 86% met their own criteria for good management (Leverington et al. 2010). Research across four tropical areas assessed natural vegetation changes. Overall, protected areas were effective; forest cover was often “strikingly higher” than surrounding areas (Joppa et al. 2008) and similar comparative studies found lower rates of land clearing in protected areas as compared with other land uses (Nagendra 2008). A recent global review by the World Bank shows that tropical protected areas, especially those conserved by indigenous peoples, lose less forest than other management systems (Nelson and Chomitz 2011). Similarly a study by the UNEP World Conservation Monitoring Centre found that forests in protected areas accounted for just 3% of tropical forest losses from 2000-2005 in countries studied, considerably less than in surrounding landscapes (Campbell et al. 2008). While it is clear that protected areas are not complete proof against habitat degradation, they generally provide better protection than competing land-use options. 33How well protected areas deliver ecosystem services depends on how effectively they are managed,how they are integrated with surrounding landscapes and land use strategies and whether they are supported by local communities.Protected areas exist under a range of management and governance regimes, from strict no-access areas to protected landscapes and indigenous reserves that include human settlements and cultural management. Consolidating, expanding, and improving the global protected area system, will require engagement of multiple partners, from communities to NGOs, government agencies and the private sector but is a necessary and logical response to both climate change and the crisis of biodiversity loss. 34The ‘perfect storm’ of unchecked population growth, unprecedented urbanisation, huge rises in resource use and climate change, are combining to impact massively on biodiversity and ecosystems with serious consequences for people and the natural world. Ensuring a more sustainable future will require a suite of actions, including greater support for natural solutions and expansion of the world’s protected areas. Making protected areas a key part of national and local responses to climate change and other environmental challenges can help to reduce rates of deforestation, protect carbon-rich habitats, ensure more sustainable land management and increase the resilience of human communities, especially the poorest and most vulnerable. At the same time, it is crucial to examine who is empowered to act as custodians of natural landscapes and seascapes, and to locate conservation activities within the appropriate economic, political, social and cultural contexts. While protected area systems are already providing multiple benefits and could become even more important in helping societies to meet development needs, achieving these multiple objectives requires at least a consideration of the following actions. More and larger protected areas and buffer zones: to improve ecosystem resilience particularly in areas with both high carbon and high biodiversity or where ecosystem services are under threat, such as in watersheds, tropical forests, peat, mangroves, freshwater and coastal marshes, and sea grass beds. Recognition and implementation of the full range of governance types from protected areas managed by state agencies to conservation areas managed by communities, indigenous peoples and the private sector. Increasing the level of protection within protected areas: to protect and manage specific features with high carbon storage values, for example, to maintain old-growth forest or avoid loss and degradation of wetland and peat habitats. Improving management within protected areas: to maintain conservation and carbon values and reduce degradation of habitats through threats such as illegal logging, agricultural encroachment, overexploitation, poor fire management and invasive alien species. Restoration strategies: to restore degraded habitats within and around protected areas to enhance carbon and biodiversity values. Better integration of protected areas within broader spatial and development planning: to identify places where natural ecosystems are protecting essential ecosystem services and could prevent and mitigate natural disasters. This includes determining when, and where there are social and economic benefits from incorporating “green” infrastructure within development plans. Develop innovative financing strategies for protected areas, which recognise payments for ecosystem services, including additional government budget support or direct payments from communities and/or industries which benefit from the services provided. 35Climate change increases the threats to biodiversity but it also provides a unique opportunity to re-emphasize the multiple values of biodiversity and ecosystem services and their contribution to both mitigation and adaptation strategies and human welfare. For too long, these services have been regarded as “free goods” rarely, if ever, acknowledged in national accounting. New initiatives such as TEEB and the availability of substantial international finance for REDD are highlighting the importance of natural habitats in addressing some of the most significant impacts of global change. 36The global system of protected areas, now numbering more than 200,000 sites, and represented in every country on Earth, is critical for conserving biodiversity in the face of global change, including increased population, demand for resources and the inevitable consequences of climate change. It is also proving to be one of the most effective and comprehensive measures at landscape and seascape scale - to buffer societies and particularly the most vulnerable and marginalized communities, against emerging environmental challenges. Protected areas are not perfect tools, and if implemented carelessly or without regard to social consequences can cause problems for local or resident human communities, but there is increasing evidence for their net benefits. The research summarised in this paper starts to examine the significant role that protected areas can play in sustainable development and the climate agenda. By maintaining the essential ecosystem services upon which people depend, protected areas are proven, “green” and cost-effective natural solutions to help address the climate crisis and other global environmental challenges. 37The challenge remains to address key considerations of what national governments, communities and the private sector must do to maintain the value of their investment in protected areas, and to make defensible choices on how to invest in expanded and better connected systems that are specifically designed to counter the threats of climate change, increased demand and altered patterns of resource use. In addition, there is a need to radically review the inclusivity of our approaches to conservation and to explicitly involve those affected by enhanced habitat protection, in management systems that are participatory and result in more equitable distribution of benefits. Moreover, where there are investment choices to address adaptation to climate change there is a much greater need to understand how natural ecosystems and protected areas can be included in national and international responses, with implications for development assistance, research and analysis, and policy reform. Baumert, K.A, T. Herzog, and J. Pershing (2006). Navigating the Numbers. Greenhouse Gas Data and International Climate Policy. World Resources Institute, Washington, D.C.
Bellard, C. et al. (2012). Impacts of climate change on the future of biodiversity. Ecology Letters (2012):1-13. Binet T. et al. (2012). Évaluation de la valeur économique et sociale des écosystèmes associés aux AMP de l’Afrique de l’Ouest. Rapport N°2 Estimation de la valeur économique et sociale d’un échantillon d’AMP en Afrique de l’Ouest, projet « Appui au renforcement institutionnel du Réseau Régional d’AMP en Afrique de l’Ouest et à la mise en oeuvre de son plan de travail », Dakar, Sénégal. Borrini-Feyerabend, G, A. Kothari and G. Oviedo (2004). Indigenous and Local Communities and Protected Areas: Towards Equity and Enhanced Conservation. IUCN/WCPA, Gland. Switzerland. Campbell, A. et al. (2008) Carbon Emissions from Forest Loss in Protected Areas. United Nations Environment Programme–World Conservation Monitoring Centre, Cambridge, U.K.
CBD (2010) Global Biodiversity Outlook 3. Secretariat of the Convention on Biological Diversity. Montreal. Cheung, W. W. L. et al. (2009). Projections of global marine biodiversity impacts under climate change scenarios. Fish and Fisheries 10: 235-251. Costanza, R. et al. (1997). The value of the world’s ecosystem services and natural capital. Nature, 387: 253–260. Damania, R. et al. ( 2008). A Future for Wild Tigers. World Bank, Washington, D.C.
De Morais L.T et al. (2007). Suivi biologique des peuplements de poissons d’une aire protégée en zone de mangrove : le bolong de Bamboung (Siné Saloum, Sénégal) – IRD. Dudley, N. (2008) Guidelines for Applying Protected Area Management Categories. IUCN, Gland, Switzerland. Dudley, N. and M. Aldrich (2007). Five years of implementing forest landscape restoration: Lessons to date. WWF International, Gland, Switzerland. Dudley, N., K. MacKinnon and S. Stolton (in press). Reducing vulnerability: the role of protected areas in mitigating natural disasters. In: Renaud, F.G., K. Sudmeier-Rieux & M. Estrella (Eds.) The Role of Ecosystems for Disaster Risk Reduction, Tokyo. United Nations University Press. Dudley, N . et al. ( eds). (2010). Natural Solutions: Protected Areas Helping People to Cope with Climate Change. IUCN-WCPA, TNC, UNDP, WCS, World Bank and WWF, Gland, Switzerland. FAO, 2009. The State of World Fisheries and Aquaculture. FAO, Rome. Gitay, H. et al. (eds). (2002). Climate Change and Biodiversity. Technical Paper V. IPCC, Geneva, Switzerland. Halpern, B.S. (2003). The impact of marine reserves: do reserves work and does reserve size matter? Ecological Applications 13: 117-137. Hannah, L., G.F.Midgley, and D. Millar ( 2002). Climate-change integrated conservation strategies, Global Ecology and Biogeography 11: 485-495. Hirji, R. and R. Davis (2009). Environmental Flows in Water Resources Policies, Plans and Projects. Case Studies. World Bank, Washington D.C.
IFRC (International Federation of Red Cross and Red Crescent Societies). (2002). Mangrove Planting Saves Lives and Money in Vietnam. World Disasters Report Focus on Reducing Risk. IFRC, Geneva, Switzerland. Janzen, D. (1999). Gardenification of Tropical Conserved Wildlands. Multitasking, Multicropping and Multiusers. Proceedings of National Academy of Sciences. 96 (11): 5987-94. Jeng, H. and Y. J. Hong (2005). Assessment of a natural wetland for use in wastewater remediation, Environmental Monitoring and Assessment 111: 113-131. Kapos, V. et al. (2008). Carbon and Biodiversity: A Demonstration Atlas. United Nations Environment Programme–World Conservation Monitoring Centre. Cambridge, U.K.
Laffoley, D. and G. Grimsditch (eds) (2009). The Management of Natural Coastal Carbon Sinks. IUCN, Gland, Switzerland. MacKinnon, J. et al. (1986). Managing Protected Areas in the Tropics. IUCN and UNEP, Cambridge. MacKinnon, K. et al. (1996). Ecology of Kalimantan, Indonesian Borneo. Periplus, Singapore. MacKinnon, K., P. Brylski and A. Kiss. (2005).West Tien Shan. At The crossroads of Central Asia. In Transboundary Conservation. A New Vision for Protected Areas. (editors R.A. Mittermeier, C.F. Kormos, C.G. Mittermeier, P. Robles Gil, T. Sandwith and C. Besancon) Pp. 285-289. CEMEX, Agrupacion Sierra Madre, Conservation International, Mexico. MacKinnon, K., N. Dudley and T. Sandwith(2011). Protected areas: helping people to cope with climate change. Oryx 45(4):461-462. McShane, T.O. and M. Wells (eds.) (2004). Getting biodiversity projects to work: Towards more effective conservation and development. Columbia University, New York. Miles, L., and V. Kapos (2008). Reducing Greenhouse Gas Emissions from Deforestation and Forest Degradation: Global Land Use Implications. Science 320: 1454–55. Millennium Ecosystem Assessment (MEA). (2005). Ecosystems and Human Well-being: Biodiversity Synthesis. World Resources Institute, Washington, D.C.
Mills, M. et al. (2011). Incorporating Effectiveness of Community‐Based Management in a National Marine Gap Analysis for Fiji Conservation Biology 25: 1155–1164. Niang I. et al. ( 2012). Guide sur les options d’adaptation en zones côtières à l’attention des décideurs. UNESCO/COI, Dakar. Parish, F. et al. ( eds) (2008). Assessment on Peatlands, Biodiversity, and Climate Change: Main Report. Wetlands International, Kuala Lumpur, Malaysia. Peskett, L.et al. (2008). Making REDD Work for the Poor. A Poverty Environment Partnership (PEP) Report. Overseas Development Institute, London, U.K.
Pierce, S. M. et al. (eds) (2002). Mainstreaming Biodiversity in Development: Case Studies from South Africa. World Bank,Washington, DC. Quintero, J.D. (2007). Mainstreaming Conservation in Infrastructure Projects. Case Studies from Latin America. World Bank, Washington D.C.
Sandbrook, C. et al. (2010). Carbon, forests and the REDD paradox. Oryx 44(3):330-333. Sandwith, T., S. Ranger & J. Venter (2010). Joining the dots: Stewardship for Connectivity Conservation in the Cape Floristic Region, South Africa. In: G, Worboys, W. Francis and M. Lockwood, (eds). Connectivity Conservation Management. A Global Guide. Earthscan. Simms, A., J.Magrath and H. Reid (2004). Up in smoke? Threats from, and responses to, the impact of global warming on human development. New Economics Foundation, London. Stolton, S, N. Dudley, & J. Randall(2008). 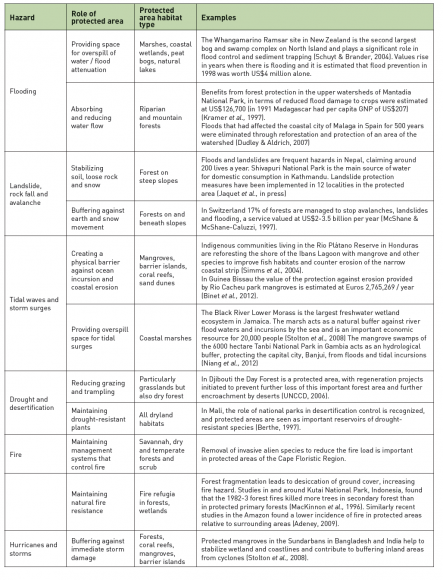 Natural Security: Protected areas and hazard mitigation. WWF International, Gland, Switzerland. Stolton, S and N. Dudley. (eds)(2010). Arguments for Protected Areas. Earthscan, London. TEEB (2009). The Economics of Ecosystems and Biodiversity Summary for Policy Makers. UNEP and EC, Nairobi and Brussels, Kenya and Belgium. WCPA (2012). Natural Solutions: Protected areas maintaining essential water supplies. Fact sheet. IUCN/World Commission on Protected Areas. Gland, Switzerland. Wells, M.et al (1999). Investing in Biodiversity: A Review of Indonesia’s Integrated Conservation and Development Projects. World Bank, Washington D.C.
Worboys, G.L, W.L.Francis and M. Lockwood(eds) ( 2010). Connectivity Conservation Management. A Global Guide. Earthscan. World Bank (2003). Cornerstones for Conservation. World Bank Assistance for Protected Areas. World Bank, Washington, D.C.
World Bank (2010a). Convenient Solutions to an Inconvenient Truth: Ecosystem-based approaches to Climate Change. World Bank, Washington, D.C.
Wunder, S. (2012). Of PES and other animals. Oryx 46(1):1-2. WWF (2008). Water for Life: Lessons for Climate Change Adaptation from Better Management of Rivers for People and Nature. WWF International, Gland, Switzerland.